I provision new servers (usually VMs), but some physical and some cloud-based. I patch and maintain those servers. I provide or rescind access to the applications on those servers. I monitor those servers for performance and uptime. And when those servers go down, I am the first one who gets called. My primary pane of glass is a systems or platform management UI, and I don’t want to learn a new UI “just” for backups. More importantly, I don’t want to become skilled as a backup administrator, per se – I just want the backups to be part of my systems management tool set (just like patches, monitoring, etc.). Large platform vendors, Microsoft and VMware, get it – they used to sell Data Protection Manager as part of System Center and VDPA as part of the vOperations set of offerings (respectively), but neither try to monetize the DP component anymore; it’s just built-in to those suites. Fast forward and Azure is learning from that with its own backup services within the Azure management tools. Some data protection vendors ensure that their mechanisms can be invoked within systems management frameworks, such as vCenter or System Center; others actually have their own systems monitoring tools that integrate with their and other data protection products. This one will be very interesting to watch as a differentiator while the convergence continues. Some vendors offer monitoring technologies for a variety of disparate data protection products, due to the recognition that most organizations have more than one DP tool. As such, these monitoring tools are invaluable in aggregating and normalizing the status and compliance of the underlying DP mechanisms. Ideally, those aggregations then roll up to dashboards or other higher-level systems or platform management frameworks. Hyperconvergence vendors are increasing talking about data protection as part of their offerings, including both built-in mechanisms and integrations with industry-leading backup vendors, which are often then manageable through the HC/CI platform management UI. Another group that gets it is ESG. 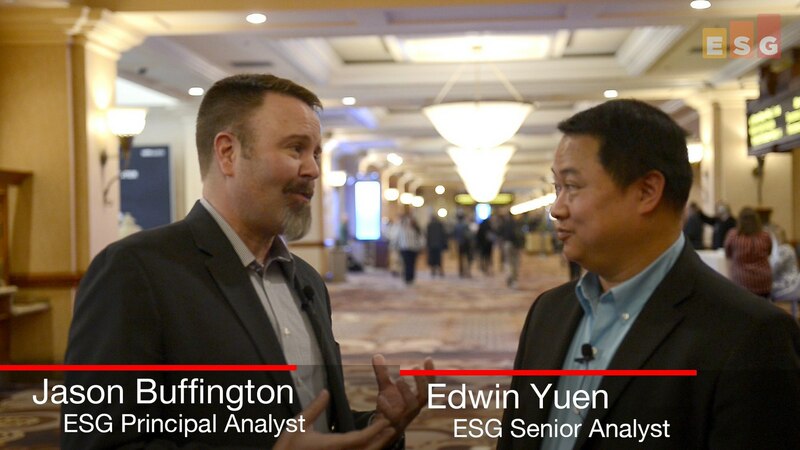 Last year, we brought on another analyst, Edwin Yuen, to expand ESG’s coverage of Systems and Platform Management. Edwin and I first worked together in the Microsoft Systems Center team; he later spent time with HPE before arriving at ESG. Here’s a brief viewpoint from each of us on the convergence of data protection within system management, which we shot at VMworld. If you haven’t already, follow Edwin on Twitter … check out his other blogs at ESG … and look for more coverage of Data Protection within Systems Management from the two of us moving forward. As always, thanks for reading, watching, and sharing ideas.